The Golden Thread - View topic - LIGHTS UP IN THE NIGHT SKY ??? LIGHTS UP IN THE NIGHT SKY ??? The plumes were chemical tracers (trimethyl aluminum) deposited in the upper reaches of Earth's atmosphere by five rockets launched rapid-fire from NASA's Wallops Flight Facility in Virginia. The goal of the experiment, named ATREX (Anomalous Transport Rocket Experiment), is to study 3D turbulence in the thermosphere. "We saw the rockets lift off and then slowly release their chemicals, creating trails in the sky," reports Alice B. of Loudoun County, Virginia. 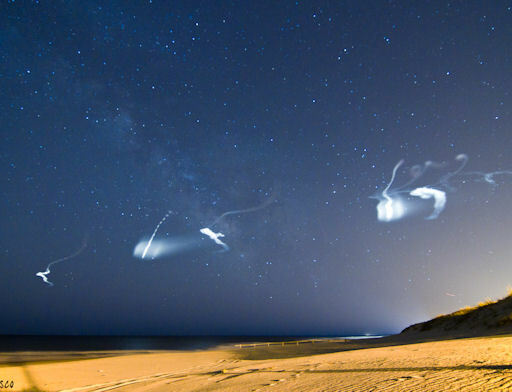 "We could also see what I assume were the rocket remnants falling back to Earth." "Once the chemical tracers from the rockets were released, the view was amazing," adds Bryan Lauber of Frenchtown, NJ. "The tracers were extremely bright and seemed to just fall out of the sky!" - an episode in the Project Blue Beam Saga....? Re: LIGHTS UP IN THE NIGHT SKY ??? If not PBB - then it is damn fine fireworks display! And a pretty costly price to boot! Thanks for bringing the link to PBB on the GT here Ruts. At least it has been placed on record and now the people of the world have knowlwdge of this.